From the Toronto Star, February 10, 1977. 9:10 a.m., February 10, 1977. Chaos reigned on the platforms of Dundas station, which was jammed beyond capacity with people eager to attend the opening of the Eaton Centre. “Passengers got close to hysteria as they were dumped out into dense crowds that couldn’t get through the single open exit fast enough,” the Globe and Mail reported. Up above, by the entrance to Trinity Square, around 4,500 gathered for the official opening ceremony. A group of trumpeters descended from a balcony, along with 16 costumed representatives of the city’s ethnic communities. Pipers from the Toronto Scottish Regiment led in the official party, then the 48th Highlanders escorted Ontario Lieutenant-Governor Pauline McGibbon, who received the loudest cheers from the crowd. McGibbon, Mayor David Crombie, and other dignitaries cut a red ribbon with scissors presented on blue velvet cushions by Girl Guides. A planned salute to the new mall by the Fort York Guard was scratched when, following a rehearsal, it was felt musket fire would frighten elderly patrons. 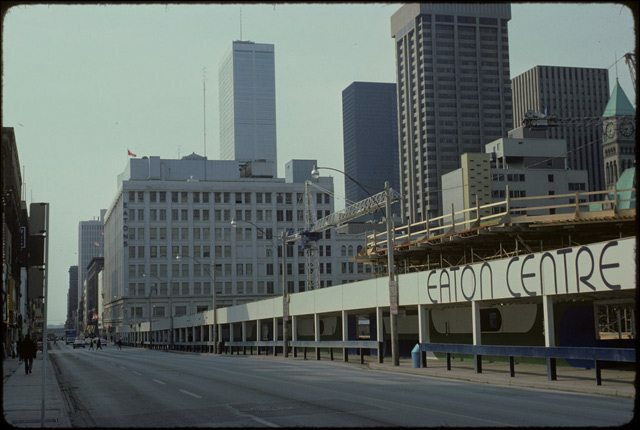 The Eaton Centre was still a work in progress. 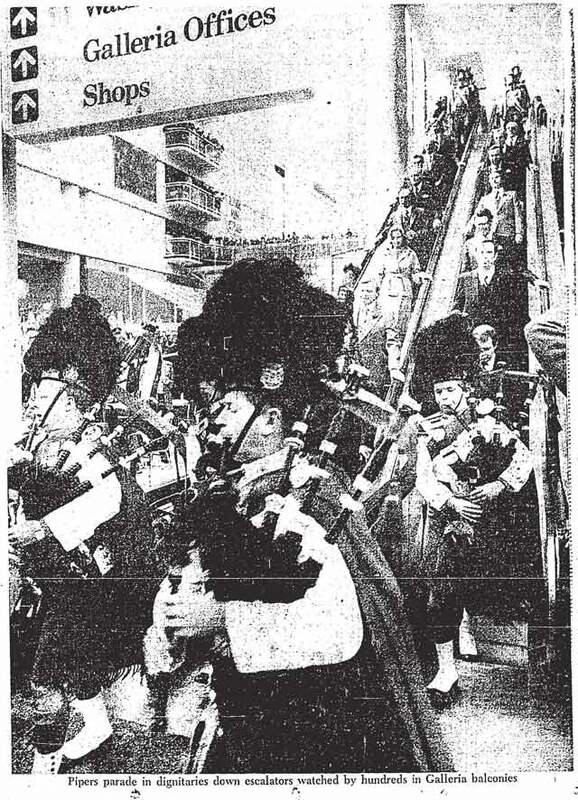 The festivities marked the opening of its first phase, which consisted of an office tower on Dundas Street, Eaton’s new flagship store, and a glass-covered galleria stretching from the store south to Albert Street. The next phase, which would extend the mall to Queen Street, link it to Simpsons, and toss up another office tower, would soon begin with the demolition of Eaton’s old main store. One version of the 1960s Eaton Centre, which in this case retained the Old City Hall clock tower. The Eaton Centre: a project dedicated to the revitalization of downtown Toronto. (Toronto: c.1966). For Eaton’s executives, the day culminated two decades of controversy surrounding the $250 million complex’s development. 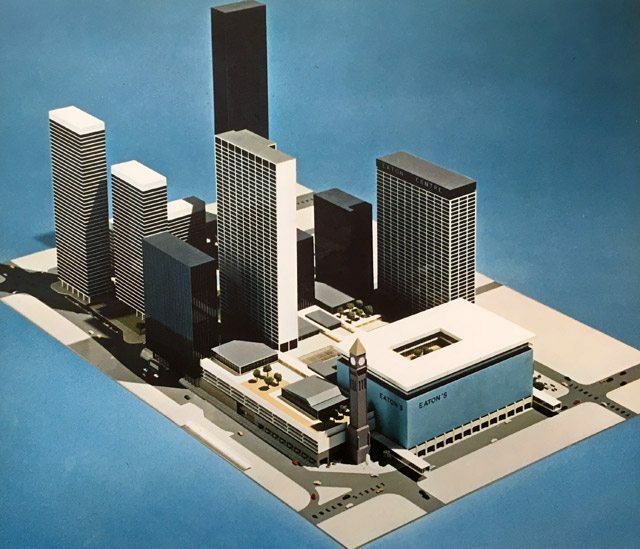 A mid-1960s plan aroused public opposition when it proposed demolition of Old City Hall. For a time, the idea was scrapped entirely. There were two years of negotiation with Church of the Holy Trinity before an agreement was reached between the congregation and developers to protect the historic church’s access to sunlight. City Council placed several conditions on its approvals for the project, from timeframes for when construction had to begin to ensuring cars parked in the garage weren’t visible to pedestrians along Yonge Street. 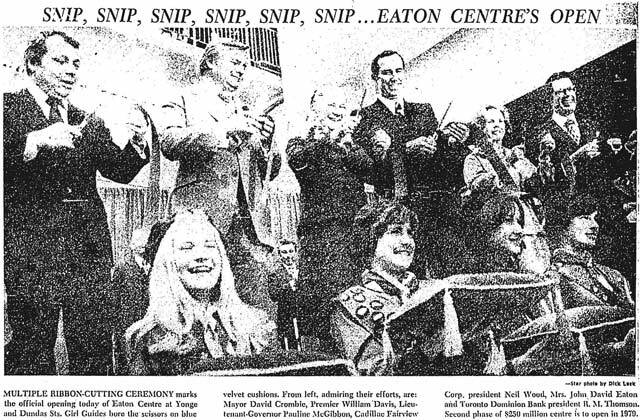 There were some councillors who didn’t warm to the Eaton Centre—Elizabeth Eayrs called it “a plastic temple of consumerism,” while John Sewell didn’t want to give the developers too much leeway. 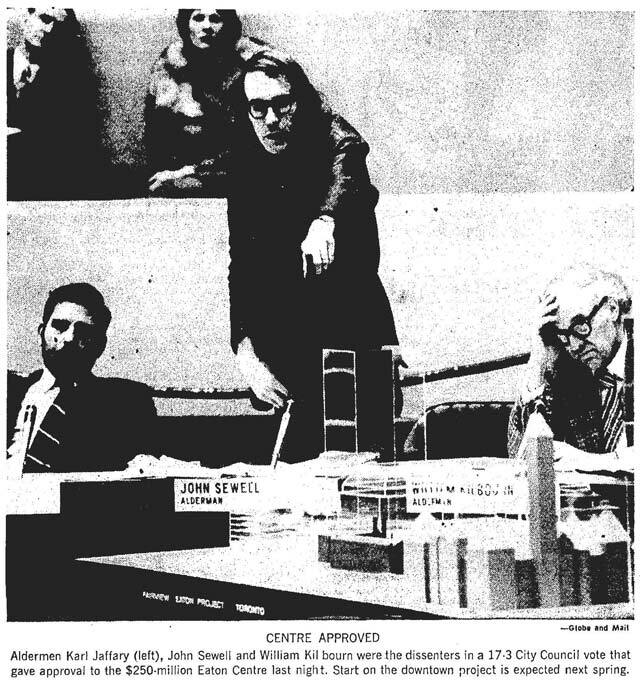 ”It’s the old question of who is running this place—Eaton’s or council,” Sewell noted in February 1974. 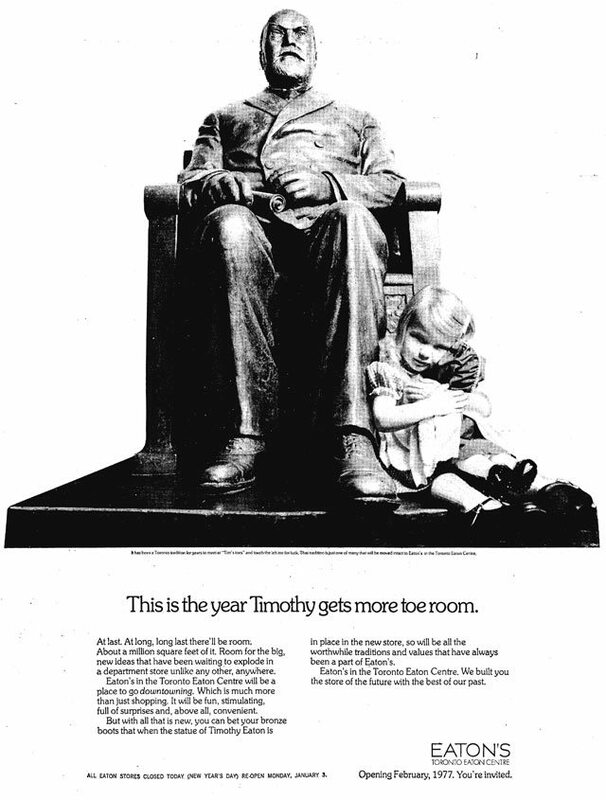 From the Globe and Mail, November 24, 1972. When the building permits were finally approved a month later, Crombie reminded councillors that they should abide an earlier agreement with developer Cadillac Fairview that discouraged a shopping list of design changes. “Some want it black and others want it green,” Crombie noted. “I worry about that sort of thing after watching what has happened in this debate.” Construction pushed ahead, with shovels in the ground by the end of spring. 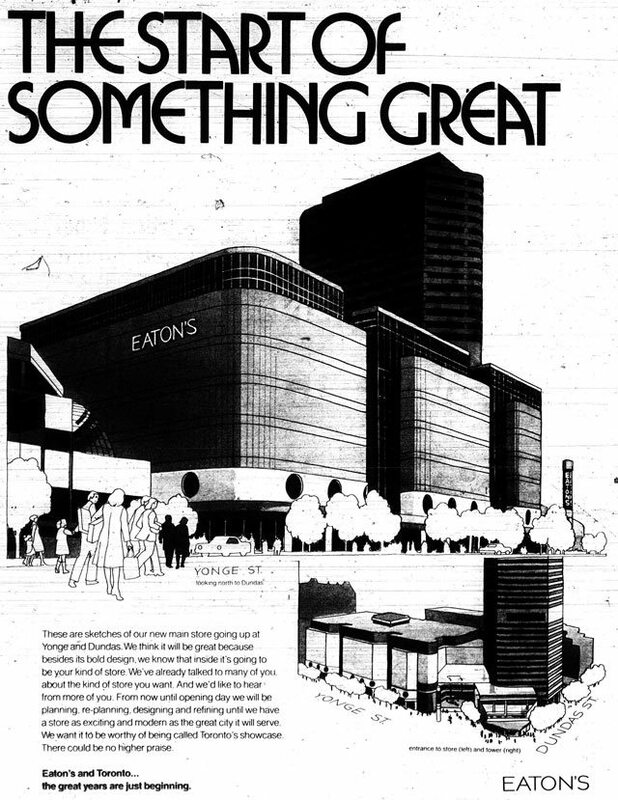 As opening day neared, Eaton’s chairman of the board John Craig Eaton told a press conference that the new store would be “the model for all department stores that will be built over the next 20 years.” An ad published in January 1977 whetted shoppers’ appetites with a lengthy guide to the new store’s nine retail floors. At the bottom was 3 Below (the current food court), which catered to youth via fashions, records, live performances, pizza, and subs. While the lower subway level offered a marketplace, the upper subway floor promised “male liberation” with stereotypically manly services, including a barber shop and Sir John’s, described as “a thoroughly masculine steak-style self-serve restaurant licensed under the L.L.B.O.” After two floors geared to women, the third featured an event space. 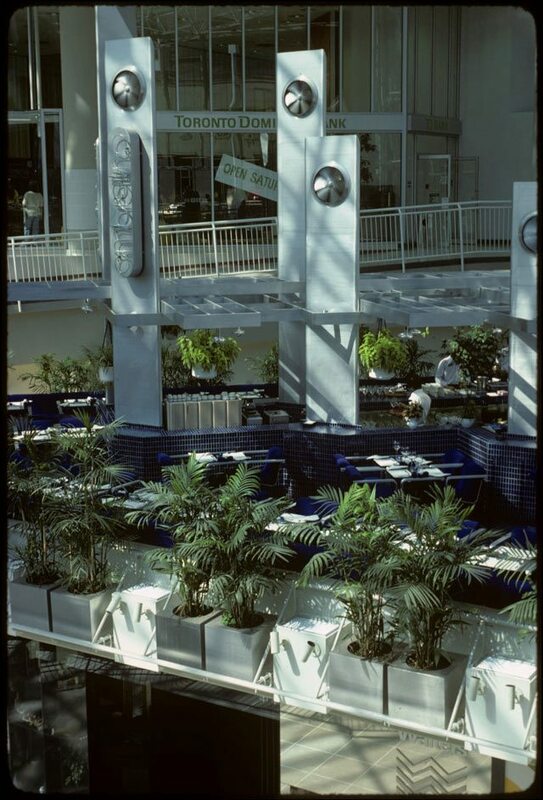 The sixth floor included the largest of the store’s six eateries, the 1,000 seat Marine Room. View of exterior of Eaton Centre construction site, with sign. The Queen Street Eaton’s store can be seen in the background. Photo by Harvey R. Naylor, April 18, 1975. City of Toronto Archives, Fonds 1526, File 84, Item 60. To prepare for the big day, two-week closing sales were held at Eaton’s Queen Street and College Street (now College Park) stores. Past and present employees previewed the new flagship on February 6. “My God, it’s huge,” noted retiree Alf Ryan. “You need a compass to get around. I think I like it. There were all kinds of memories in the old place but I suppose after a few Christmases, this store will look more lived-in. You gotta keep up with the times, I guess.” A two-day soft opening followed, allowing staff to familiarize themselves with the space. From the Globe and Mail, January 1, 1977. Out in the mall, shoppers received giveaways ranging from bags to shoe horns. Of the 150 spaces available in phase one, 120 were leased. Around 25 stores had to miss opening day while conducting appeals related to new federal quotas on clothing imports, which affected their inventories. The three levels of the main galleria were themed by offerings, as one ad outlined. Level One will feature fast turnover items, such as records, books, stationery, drugs, food, and impulse buys, as well as banks and other services. Level Two is primarily fashions and accessories. Level Three is made up of specialty shops, fashion boutiques and the better quality outlets of Canada’s major chains. From pre-teens to grandmothers, they’re all there, leaning against the white iron rails, waiting expectantly for the fountain to do its number. Whoosh. Suddenly, up like a geyser shoots a jet of water 45 feet high, splattering it on the stone and glass surfaces around it. The spectacle is brief. The crowds move away and get back to the business of shopping at the Toronto Eaton Centre. Fountain-watching rivals people-watching at the centre. Third subject of study is the mass of exotic plants bathed in sunlight and artificial light. Why, in that warm, bright atmosphere, the philodendron might have a baby leaf by the time it takes to climb from the subway level to the top of the galleria. Whether you’re a serious shopper, a browser, a bargain-hunter, or merely one who likes to gaze at pretty sights, the new Eaton Centre has something for you. If you’re looking for a five-foot-two brunette, or a six-foot blonde, you can’t go wrong there. For the new giant climate-controlled city-within-a-city may be the largest single hangout for beautiful women this side of the beach at Rio de Janeiro. The place is lousy with them. They’re hanging over the railings in the multi-levelled mall, sitting at the fountain, sipping coffee in the cafes. And they’re strolling. Always strolling. The stream seems endless. Interior view of tables and some stores in new Eaton Centre. Photo by Harvey R. Naylor, May 25, 1977. City of Toronto Archives, Fonds 1526, File 92, Item 5. Additional material from The Eatons: The Rise and Fall of Canada’s Royal Family by Rod McQueen (Toronto: Stoddart, 1999); the January 14, 1977, January 15, 1977, February 11, 1977, and February 12, 1977 editions of the Globe and Mail; the February 19, 1974, March 5, 1974, February 7, 1977, February 8, 1977, and February 10, 1977 editions of the Toronto Star; and the February 9, 1977 and February 11, 1977 editions of the Toronto Sun.